A Yemeni official said on Tuesday in the Saudi capital Jeddah that President Ali Abdullah Saleh suffers from a throat ailment, although his general condition is stable. 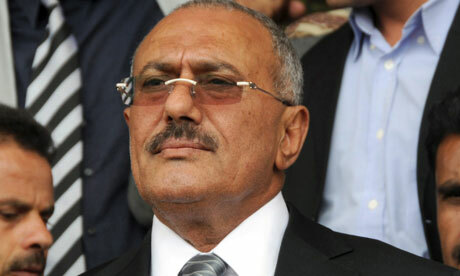 Saleh is served in Riyadh, along with other government officials injured when a rocket exploded in the mosque where he prayed on 3 June in the presidential compound. In a telephone conversation, the officer said he could not specify the nature of the disease in the throat and refused to be identified because of the sensitivity of the information. The prime minister suffered severe burns and his condition is "tragic,''the official said. The President of the Shura Council is in critical condition, lost his left eye and transferred to London for treatment. A deputy prime minister lost his leg left and the other is stable.